The perfect place to call home. This adorable house is on a flat .51 acre lot in the desirable Kings Valley neighborhood. The main level has beautiful wood accents and updates to accommodate anyoneâs desires. Some updates include new windows, roof, stainless steel appliances, butcher block counters, back-splash, floors and doors. The much wanted open floor plan on the main level will be one of the many things youâll love about this home. The 3 bedrooms are on the top floor, along with an updated bathroom and all new doors. There is a 2nd living room, office/work-out room and Â½ bath downstairs. There are 2 fireplaces to keep you cozy. The interior of the house has been freshly painted, along with many updates throughout. Enjoy the fresh mountain air on your large, south facing deck any time of year. The over-sized 2-car garage has a workbench.There is plenty of parking, along with a large flat area to park your RV. 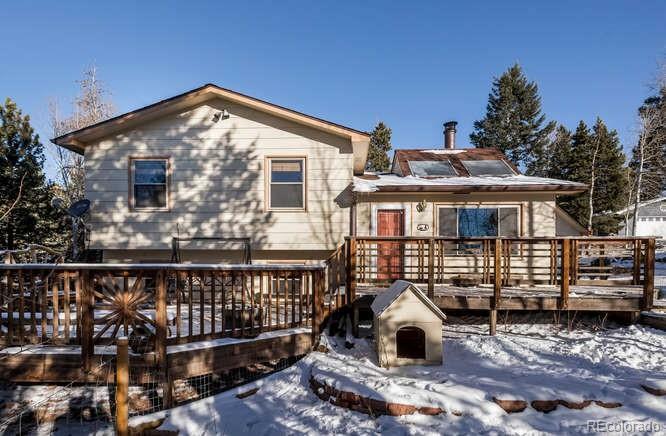 Close to amenities in Conifer. Come fall in love!